There's nothing worse than looking back on your wedding photo and wondering what you were thinking when you chose your hairstyle. With a timelessly elegant style like a classic chignon, you'll never look dated or trendy in your photos. Instead, with this updo you'll feel beautiful whenever you remember this special day. If you're a bride to be, chances are you're scouring tons of wedding updo photos in an effort to find your perfect look. Whether you're having a formal elegant affair, or a casual beach side wedding, there's the perfect updo for every bride. 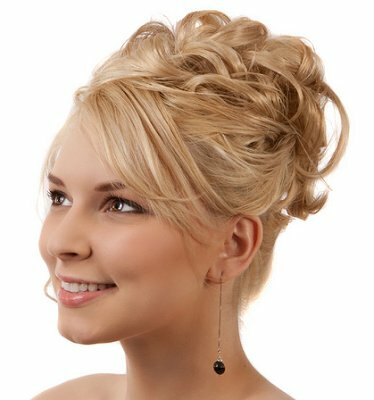 An elegant, intricate updo with tons of twists and knots is perfect for a formal nighttime or black tie wedding. This style is perfect for brides with long, thick hair or if you plan to get married outdoors because it limits the likelihood of frizz. Off centered curls adds whimsy to your style, but it’s no less a classical and sophisticated look. You’ll need plenty of hair clips or bobby pins, along with hair spray, in order to keep this style neat and well maintained. From there, be sure that the hair accessory you choose is bold and large enough to stand out in photographs. If you're a bride who loves the vintage glam of the 1940s, try a retro updo by creating height and a soft, smooth wave. Be sure to use a smoothing serum before pulling up to ensure that every hair stays perfectly in place. Finish off the look with black liner and scarlet lips to keep in line with the vintage feel. Soft and romantic, tousled curls that are loosely pinned can be the perfect complement to a feminine, lacy wedding dress. For this look, you’ll want to make sure you have several beautiful hair clips on hand. To achieve these curls on relaxed hair, use a curling iron, curl hair in different directions and then clip the curls up. For the front of the hair, decide if you would prefer traditional bangs, or soft side swept ones. If you're planning beach side nuptials or a casual, backyard wedding, keep your updo simple and textured by adding braids to a low bun at the nape of the neck. If you love the look of long, loose hair for your wedding, but don't want to leave your locks completely down and flowing, pin the top portion up and away from face and leave the back long and flowing. Adding shiny, polished curls ups the glam factor. Many cultures, including the Indian culture, feature prominent headpiece jewelry. If you want to do the same, take a cue from this model and sweep bangs off to the side. This way, the jewelry and your eyes become the main focal point. To keep hair interesting, add curls. You can do this in one of two ways. Either curl hair first, and then place in a ponytail. From there, take each curl and wrap it around the pony, securing with pins as you go along. Alternatively, you can place hair in a ponytail first and then curl the strands and arrange accordingly. Either way, this is a stunning look. If you are torn between a classic wedding updo and one that has a little more flair, get the best of both worlds with this updated version of a classic chignon. By adding intricate twists, the style looks new and fresh, but not too trendy. Adding a simple, floral accessory to your wedding day 'do adds a special touch to an otherwise simple hairstyle. You can even match your floral accessory to your centerpieces, bridesmaid dress colors or overall wedding color scheme. Or, go for a basic white rose for a chic, clean look. To view more bridal hairstyles, visit the pictures of wedding day hairstyles slideshow.